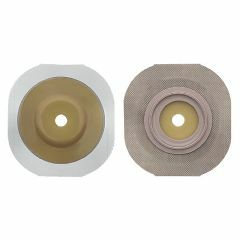 New Image FlexWear Convex Skin Barrier with Floating Flange and Tape has a built-in convexity which means added security and skin protection for recessed, retracted and flush stomas, cut-to-fit openings. It eliminates pressure on tender post operative abdomens with the exclusive Floating Flange. Superior skin care, FlexWear skin barrier is formulated to resist breakdown. FlexWear (standard wear) Skin Barrier: FlexWear is a standard wear, synthetic skin barrier, which is designed to be worn more than one day. FlexWear barrier is more resistant to breakdown than a SoftFlex skin barrier. Clear Plastic Skin Barrier Cutting Guide: This feature consists of concentric circles on a thin plastic film for cutting the skin barrier opening to the size and shape of the stoma. Integral Convexity:Skin barriers with integral convexity are indicated for stomas that are flush, recessed or retracted. These skin barriers are either pre-sized or cut-to-fit. Bathing/Swimming Allowable:Product can be worn while bathing or swimming without affecting its performance. Porous Cloth Adhesive: This proprietary adhesive is gentle to the skin for enhanced comfort. ElastaFlex Skin Barrier Backing: ElastaFlex is an ultra-thin, soft and flexible semi-permeable film that covers the skin barrier. It keeps fluids from eroding the skin barrier. Color Matching System: To help you select compatible New Image components, every box label is color-coded. First, select the proper skin barrier; then select a matching color-coded pouch ("red" skin barrier box label is compatible to "red" pouch box label). Non-Woven Skin Barrier Backing: A porous plastic that is soft and flexible. Pouch Locking System" The patented locking mechanism attaches the pouch securely to the skin barrier, preventing unintentional separation. Recommended for Post Operative Use: Product has features that would be most appropriate for post-operative care. Cut-to-Fit:Allows the user to cut the skin barrier opening to the size and shape of the stoma. Floating Flange: Allows for fingers to be put under the flange for support while attaching the pouch to the barrier. Recommended for Home Use: Product has features that would be most appropriate for home care. Tried others these work. Easy to apply. I feel safe and secure. These are the easiest and most confortable barriers to use. I have used others but I'm going back to these.